There’s wisdom in picking your competition shrewdly, my spine bone will testify to this. I once lived in an Asian country. I decided that I wanted something to do in the evenings after work, preferably an activity that killed two birds with one stone- entertained me and kept my body fit. So, I signed up for yoga classes, because I’d always been curious about it. I liked the idea of Yoga, besides, a regular gym was oh! so basic (I love how bourgie that sounds). Ok, I’ll confess. The truth is that the treadmill actually looked like a weapon of torture to me. I was quite intimidated by it. How fast would it go? Would I stay on it? Would I fly off it? Many questions that have now been answered since I finally stepped on one 8 months ago. I still remember my friend’s remarks upon learning that I’d signed up for the classes. First class, the instructor showed us a pose that seemed almost humanly impossible. Then, my rubber-bodied classmates responded by smoothly replicating the pose without breaking into a sweat. Like they were born to do this. Now, Asian women are naturally small, I suppose that given a genetic disposition to minimal body fat, effortlessly elastic joints would come in the anatomical red bow package. Me? I winced inwardly and thought to myself; These women are my competition, I mustn’t appear to be anything less than a professional Olympic contortionist in front of them. After all, I dressed to impress before leaving home that day, you know they say people will address you according to how you dress. Likewise, I would stretch to impress, perhaps people gauge one’s resilience to life’s challenges by how far they can stretch their body? My thoughts were rudely interrupted by the mythical cherub flapping on the left side of my head called “Envy”. It said to me in a harsh whisper “Ah! If she can put her head behind her buttocks, so can you. I mean, does she have 2 heads? After all, she’s a woman like you. C’mon, DO IT NOW!”. The other cherub floating on the right side of my head named “Reason” gently cooed “Hello sweetie, hmmm, you know that your joints have been stiffened by years and years of consuming hot eba. Do this thing a little at a time, you mustn’t go all the way today. Perhaps your head at your waist today and gradually at your buttocks next week”. Well, here’s the thing, the human body has a malicious way of retaliating after being literally bent against its will. The day after I bullied my body, it sent me a strongly worded memo. What started like sharp twitches along my backbone, gradually escalated to a painful squeezing feeling with each breath, and finally a shaky-shaky fever. Afterwards, it got better. I was training my body to learn to sit, roll-over and catch. Day by day, I improved at the yoga poses. Turns out the human body is rather malleable. Ha! I find that on the one hand, Jealousy is outrightly full of bitterness and negativity, on the other hand, while Envy does have strong undertones of resentment, the irony is that Envy can be gently coaxed and transformed into positive motivation. Iro and Buba is inarguably timeless, the classic tunic blouse and wrapper has been given a modern twist, with silky fabrics, revamped shape of the buba, and the twisted style of wrapping the iro in a tulip knot (why do I feel like I just wasted a good pun opportunity?). Now, younger women find it more appealing. 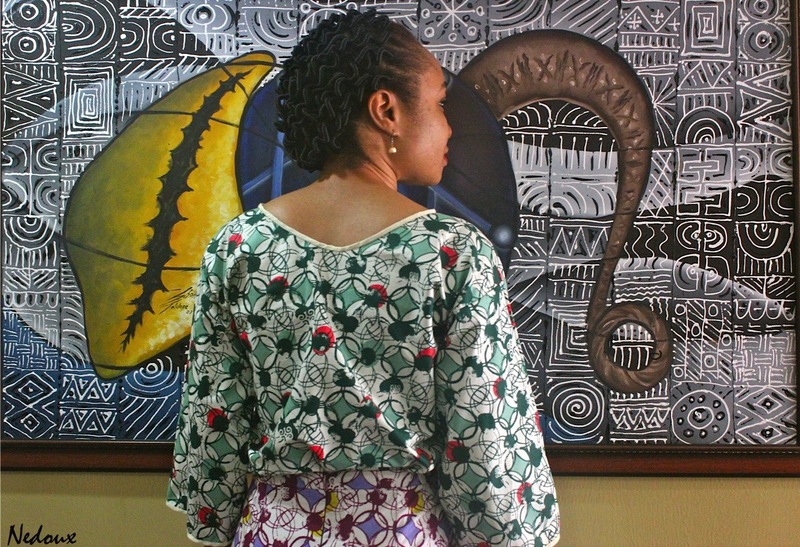 I sewed a blouse in the traditional buba style, and rather than make the traditional iro (a little over 2 yards of fabric tied around the lower half of the body), which technically is a wrap around skirt, I chose to make a pencil skirt. It was delightful to discover that fabric can be purchased per yard at the Woodin store, why become saddled with 4 extra yards when you only really need 2? 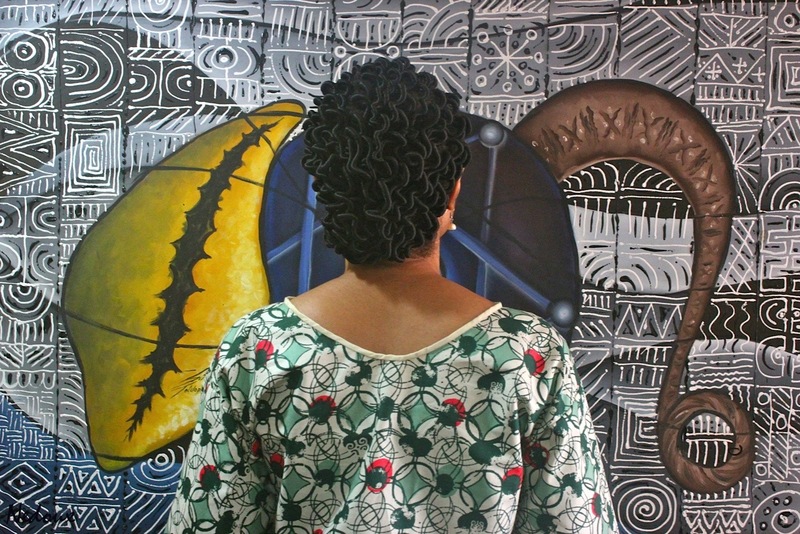 This also gives one the flexibility to mix prints and colours, which is what I did. I picked a yard each of Bottle-Green and Wine coloured fabrics in the same print. Important: Add 3 to 4 inches to this for wearing ease, plus another 1 inch for sewing allowance. Decide on the desired length [L], for mine I chose 24 inches. Cut out fabric with the following dimension; Length is derived from step three, multiplied by 2, and Breadth is derived from step two. 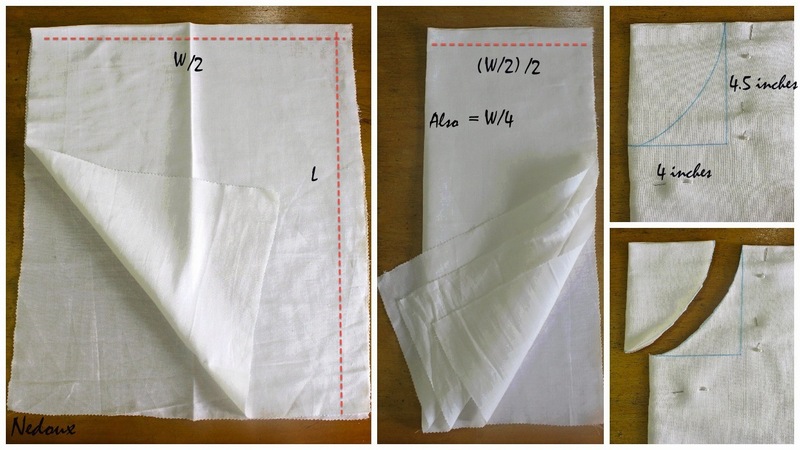 Fold the fabric, width-wise and then length-wise. The width-wise fold removes the need for a shoulder seam. 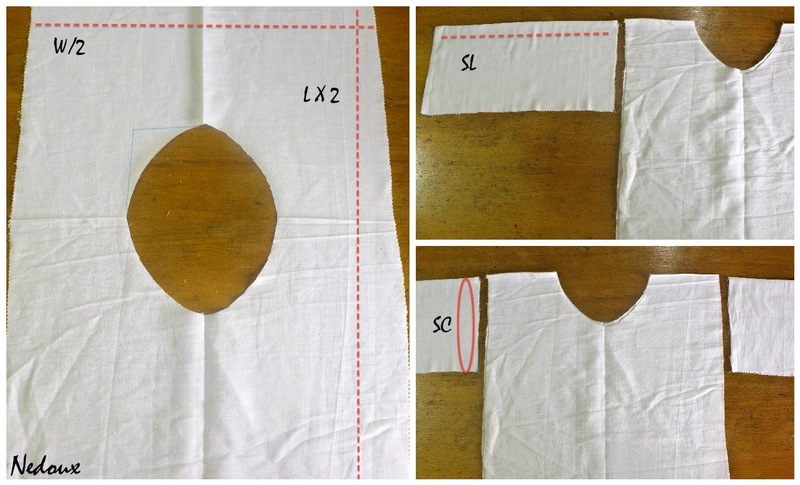 For the neckline, measure a 4.5 x 4 inches rectangle, at the corner with the folds and cut out a curved line. The sleeve circumference [SC] ranges between 17 to 20 inches for a small to medium size. The sleeve length [SL] depends on the desired style. I opted for a 3/4 sleeve and used 14 inches. 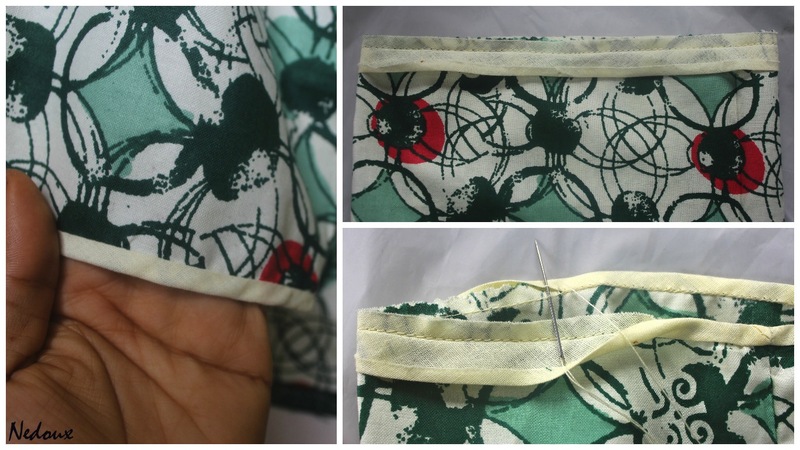 For the iro wrapper, cut out 2 yards of fabric and hem the likely to fray edges by folding twice and sewing. The skirt is fully lined with a medium weight, tightly woven cotton fabric for added volume. The skirt was hemmed with satin ribbon and hand sewn blind stitches, I passed the needle underneath one-eighth of an inch from the edge of the satin ribbon to achieve discrete stitches. The skirt lining was hemmed by binding the edge with bias tape. 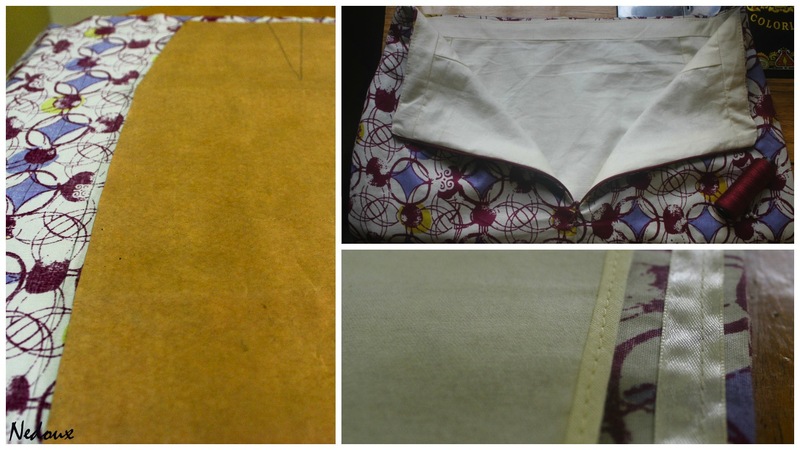 The neckline, sleeve hem and side seams of the buba were finished by binding with bias tape. The buba hemline fell tidily on the fabric selvage, and since it was cut on the grain-line, I didn’t bother hemming it. I didn’t want visible stitches at the neckline and sleeve hem, so I first sewed the bias tape to the fabric with the right sides touching and then turned the tape inward to the wrong side of the blouse and slip-stitched by hand. I passed the needle underneath the machine sewn stitch and then with a vertical motion into the bias tape, taking care to catch no more than 2 threads on the tape. This required quite a bit of patience but the tidy discrete finish made it worthwhile. I was very pleased about the tailored finish of the skirt, as I put quite a bit of work into it. I will pair it with a chiffon blouse the next time I wear it. Envy really good motivation to do/achieve more…but really taking it a step at a time makes the process more enjoyable. I love your blog. You and your iro/buba are absolutely beautiful. I’m glad I found this blog! The way you stitch different stories to make a wonderful post is amazing!! I laughed so hard this morning! I like how envy prevailed. Another very articulately written article. You are a gifted writer. Loads more grease…. Ijeomee, thank you so much for always supporting me, it means a lot to me. How?! How did it go from Yoga to a life saving opinion on envy, to iro and buba? How?!! Just how do you do this thing don Allah?! You are one hell of a fabulous wordist and I absolutely love every bit of your expressions. Thank you so much for your kind words my dear. Oh! Iro and Buba is so easy to make. Men! You are so pretty! The outfit is fab too. But I can’t just get over how pretty you are! I agree with you about envy. Surprised to see I haven’t commented on this post before but I’m here now. My current love is this material- collezioni- the bubble wrap plain one. I’m completely in lust. Btw, we are biding our time but more stories of Singaporean adventures will be told, hmm? No pockets on the skirt o. I like the midi pencil silhouette a little too much. I actually had to google this, do you mean the Daviva Collezioni? Ah! since it is lust-worthy I will definitely check it out at their store. Thanks for the tip. Yes, I do mean that one. They have many patterns of Collezioni, hold out though for bubble wrap pattern. That one is the awesomest though. That bit about “envy” is actually quite deep. I am interestingly learning that EVERYTHING is about perception! If you do not think people and the stars are out to get you, you cant be gotten! Everything that happens, good and bad, you will be able to easily take it in stride and move on. It is a very life-changing concept to grasp, really! Not easy to get there, but life-changing once you do, nonetheless. BTW, which Asian country did you live in? I really love your point of view, indeed “Everything is about perception”. Life is really quite simple once we learn to focus on the basics. Lol, Your compliments are the best! Thank you for your kind words. The yard option at Daviva!!!!!!!!!!!!! The day I found out, I was soooooo happy. I bought just one, but made a mental note to do it regularly. The last time I went, I bought 3 which are being sewn right now. I can’t wait! Lol…I was so happy too, it makes mixing & matching prints more pocket-friendly. Just love the combo. This is a job well done. For some reason, I read the title as ‘Iro Ni’, which is Yoruba for ‘It’s A Lie’, which will have been quite ironic against the text of the post, titled Irony. I can’t remember where I was going with this. That last line is dope! I imagined a party blasting Shina Peters’ music. Lovely outfit. I like the colour mix and the pencil skirt as an alternative to the traditional style. Thank you so much, I’m pleased about how the outfit turned out. I learned pretty early to make envy a propelling force to be a better version of me rather than let it eat me up or make me do something crazy. I had no idea that you’re the “Nedoux”- I’ve visited your blog several times from Berry’s but have been too shy to say hello. 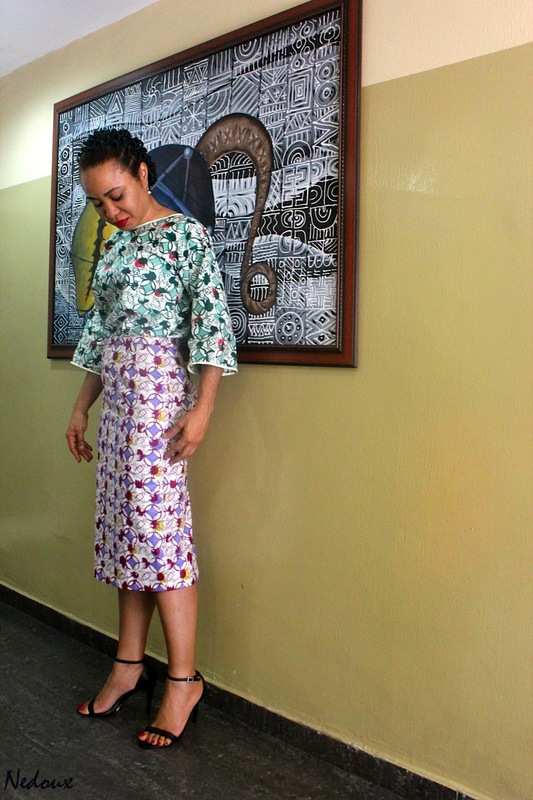 You look fabulous in this version of iro and buba and you’re giving me an idea of how to rock one. I wore one for the first time this year and felt weird! “Envy as a propelling force to be a better version of oneself” I really love your perspective. Lol @ weird. The next time that I make this, I’ll sew the traditional wrapper, I quite like how “womanly” it looks. The joints you were forcing to be malleable? The perfect outfit? Or the cutie wearing it? I need to come register for apprenticeship. The outfit is just so party ready. I sincerely appreciate your kind words, you comment made me smile. Aha! there’s a book that I’d like to recommend- ‘Dress Pattern Designing; The Basic Principles of Cut and Fit’ – Natalie Bray. It’s a great book and breaks down the science of pattern drafting wonderfully. I hope you’ve enjoyed the long weekend. I want to read your stuff everyday. Please where can I get this book? The Tailornimi store on Konga.com stocks the book. 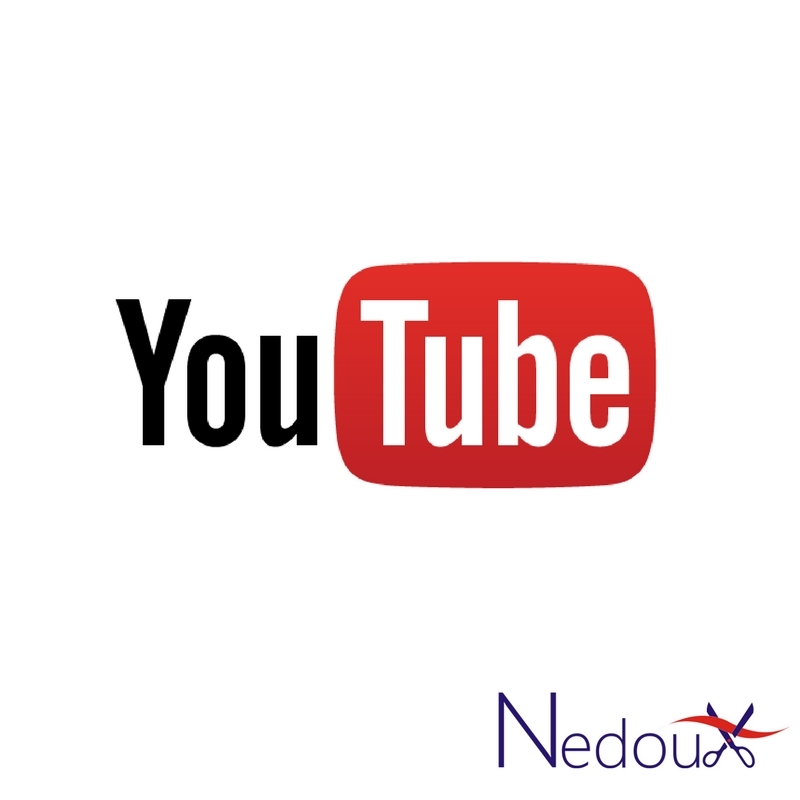 Thanks for the recommendation nedu..
You wear the Iro and Bubba well Nedoux. I’m positively envious of your sewing skills. Maybe my envy will coax me into starting my lessons.. : ) have a good weekend! Thank you my dear, I like your type of envy, sewing is a great skill. OMG the buba and iro are perfect! If you make me a buba and skirt, I will LOVE YOU. FOREVER. Not saying you have to. I’m just putting it out to the universe. Nne, I’m loving this look…From the hair to the outfit! You rocked ’em so well! “Envy can be gently coaxed and transformed into positive motivation.” –Real food for thought right here! Well done. Indeed, it is food for thought. P. S. You didn’t tell us where you took the picture. Art gallery maybe? Yes, if one takes time to separate the wheat from the chaff, when dealing with Envy, they would end up with positive motivation. Thank you so much. You’ve given me a great idea for styling the skirt, a drapy wine coloured blouse would be so elegant. Yes o, that owambe has to come. Oh! not an art gallery, it was a reception area. The painting is rather nice. ok first of all, i love the story behind it. 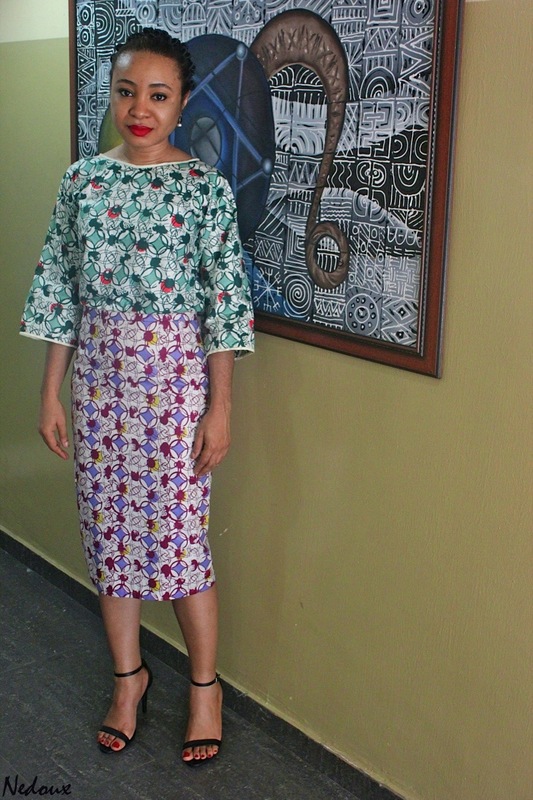 the iro and buba mixed print is very pretty. very catchy. I love what you have done with it nedoux. *sigh* This woman sha! You will just be making me jealous sha. Lol. I love the way this post evolved. I feel like previous comments articulated how I feel succinctly. Before you know it, it will accrue to an additional gown. Hehehe. Great story…..and great laughs. Great tutorial…..I am going to have to add the blouse to my list of makes. Kudos to you for hand-stitching…..I despise it..lol. Well done…..beautiful inside and out. Oh and your hair “gorgeous”. Lol, thank you so much! The buba blouse is pretty easy to make, it looks really great when a drapy, flowy fabric is used. Aww, thank you, I’m really enjoying rocking the hairstyle. The thing about envy…sigh… Best to convert that energy into taking responsibility and ACTUALLY doing something better about one’s issue of concern. Your perspective made me nod my head in agreement, Indeed, it is best to focus on one’s own self, because you never really know the other person’s actual reality. The truth underneath the facade might be quite different from public perception. I think it’s human nature to do the comparison thing once in a while, so far it doesn’t end in negativity. I had always thought of envy as an extreme form of jealousy. Glad to know it can also be a postive motivator. There’s a fine line between the two, both are rooted in negativity, but Envy can sometimes be redeemed. Thank you for reading. Have a nice week! Oh lucky you, I wouldn’t even give yoga a thought… I’m convinced I’m too stiff to attempt it. And the irony of life, while you were making your buba, I was busy converting the ones I have. Lovely outfit and mix of fabrics on a lovely lady! Really? 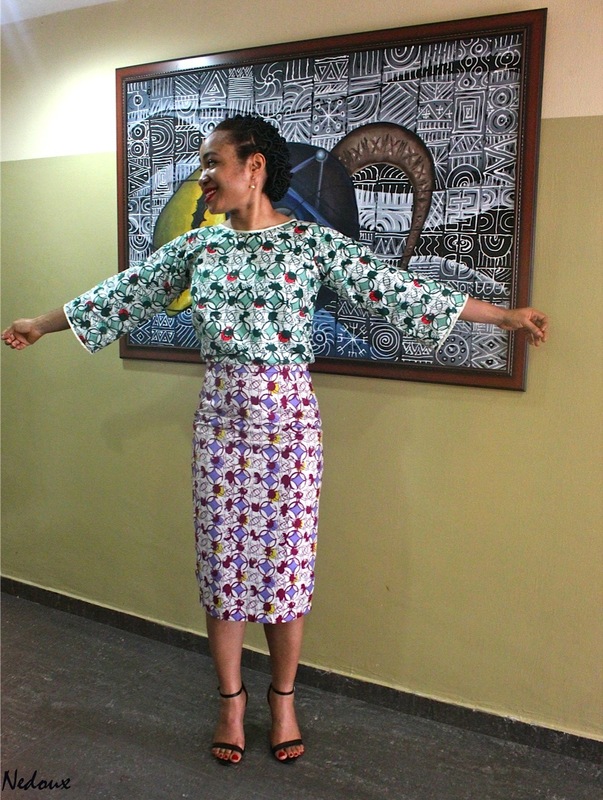 It’s nice how the buba style doesn’t interfere too much with the fabric, it would be easy to recycle the fabric. PS. You make sewing look so easy. You look wonderful! Lovely makeup too. Yoga is great way of building strength, muscle tone and flexibility. 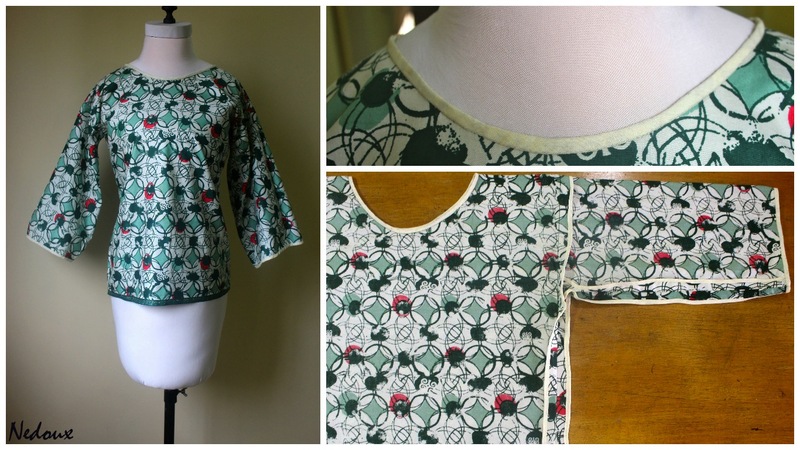 The buba blouse is the quickest sewing project that I’ve ever undertaken, it’s pretty simple. Have a super nice week! Oh I couldn’t agree more. Envy can be a positive motivator and vice versa. When I think of some people I grew up with and where they are in their lives and what they do, I beat myself up so badly one would think I was suffering lol. But like you said n like I say, they dont have two heads so all in due time Gracey, all in due time. Love your outfit and you do look like an Asian woman in these pics hehe.. I love and admire the honesty in your comment. It’s only human to do the comparison thing once in a while, it’s quite healthy even, as it means that one is mature enough to tolerate self-criticism and become motivated to devise a strategy for self-improvement.